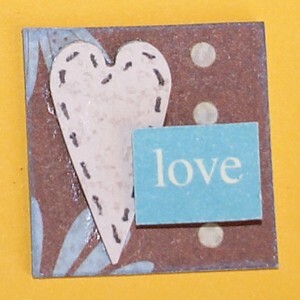 Inchies are small works of art that have quite an appeal amongst papercrafters. Got an afternoon free for crafting? Find out more here and then why not try making some miniature art yourself? Have you ever made inchies before? Is this term unfamiliar to you? let's fix that :) Or maybe you already know about this miniature form of art? They are fun to make, aren't they. 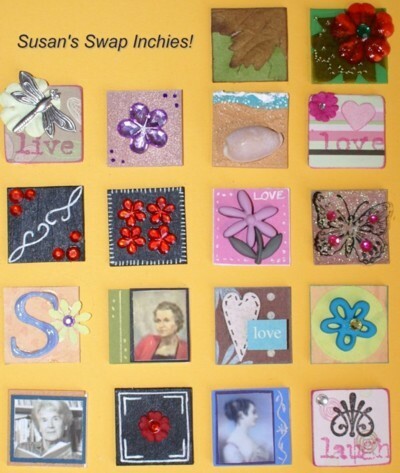 This form of scrapbooking challenges paper crafters to work with very small surfaces. 'How small? ', I hear you ask. Most people are quite amazed when they find out the answer to that question. If your work surface is too small at first, work up to it by trying Twinchies first. Some chipboard squares* measuring 1" x 1". Choose lightweight chipboard and cut it with a craft knife and a metal ruler, or buy it pre-cut. *If you don't have any chipboard don't let that stop you. Find an old cereal or tissue box and cut 1" squares from that. Glue several layers of this cardboard together till you have squares that are as thick as you want them. 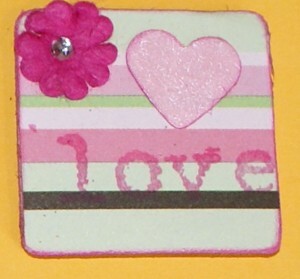 Allow the adhesive to dry thoroughly, then sand the edges a little to finish and then you can start decorating. Once you have done a set of these it will be easier to think of some other themes. What about a series on famous women (print out small photos of women you find on the Internet), or a series of storybook ideas, or choose a feeling word like 'serenity', or pick a colour and work only in those tones with different subject matter? Another idea is to try using the tiny photos you get when you ask for an index print at the photo booth. Use your imagination and enjoy the miniature world of Inchies. And if you make some, do share them with the rest of us.